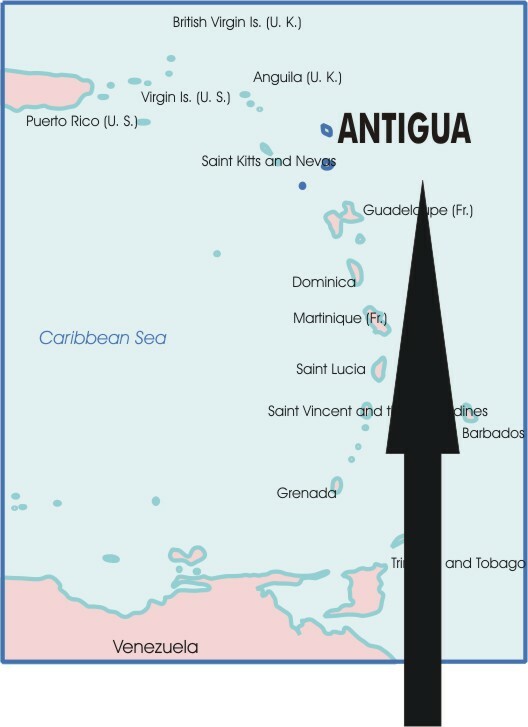 The following information about the game was provided with the board by Mrs. J. D. Miller, Jr. owner of The Pink Mongoose, a shop in St. John's, Antigua, which sold the board to the Museum. Warri means house in a great many African dialects. Games of this type came to the West Indies from the Gold Coast of Africa (now Ghana) with the slaves. The word "Warri" refers to the hollows (depressions) carved into a game board. Counters are usually nickars, a small nut belonging to the Guillandria Bush. This board, carvedin 1967 from a local island wood, is in the shape of a fish 77cm long x 20.3cm wide x 2.3cm high. Small triangular indentations form the fish's mouth, and there are some abstract cuts to indicate the head, tail, and fish scales along the body. There are two rows, each with 6 cup-like depressions about 7.5cm in diameter x 2cm deep carved into the body. At the head and tail are two oval depressions 8cm wide x 12cm long to serve as storage banks for deposit of captured counters. Counters with this board are 154 small identical local sea shells 1cm long x 1.6cm wide x .7cm high. The board was carved by an unnamed third generation descendant of a slave who had been brought from Africa to Antigua in the last century. The object of the game is to capture 25 counters. Players declare a row and storage bank as their own, and place 4 counters in each of the 6 hollows on their side of the board for a total of 24 counters on each side. Storage banks are left empty. The way to capture an opponent's counters is to end in one of the hollows where there are only one or two counters - that is if the last counter drops in an opponents hollow to make a final score of 2 or 3, these counters are captured and placed in that player's storage bank. The opening player takes all of the counters out of one of the hollows on one side of the board and sews one in each hollow in a counter-clockwise direction going around the board as far as the number of counters will warrant. Each player alternates turns, and the second player does exactly what the first player does, selecting any hollow on that player's side - that is taking all of the counters out of one of the hollows on that side and sowing one in each hollow in a counter-clockwise direction. The counters of any unbroken sequence of 2's or 3's on an opponent's side of the board adjoining and behind the plundered hollow are also taken. If a hollow contains more than 12 counters then the sowing from one hollow will be more than one complete cycle of the board. The. emptied hollow is omitted from the sowing on the subsequent cycle and it remains empty. When an opponent's hollows are empty a player must, if possible, put counters into them from the storage bank. However, if this cannot be done the game is over and all counters left on the board become the last player's.